This year my hometown is celebrating its 888 year anniversary. Not bad for such a boring little town right? One might think many events are planned but sadly this is not reality due to the tight financial situation here. During the 875 anniversary the city still used up around 150.000 Euros for all kinds of things and for this year onyl about 46.000 Euros, quite a downgrade I would say. Any who they still managed to start something new and this was the Historical Market in April. 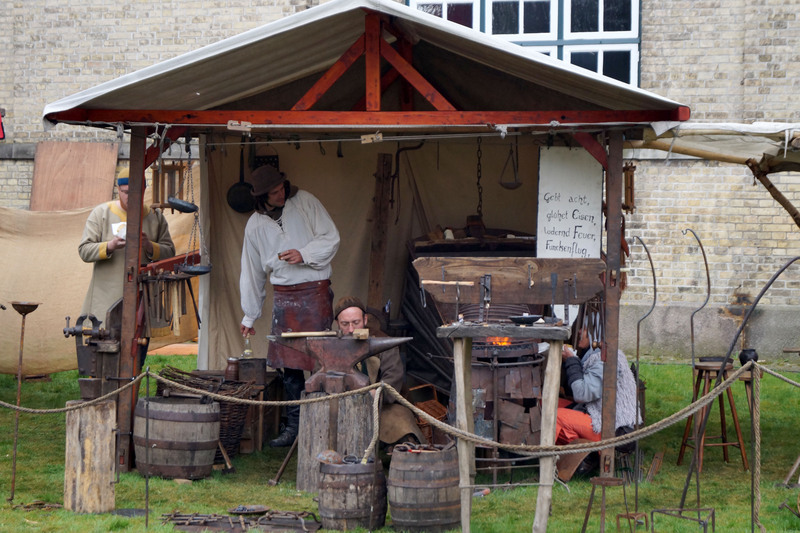 Here in Germany we have Medieval Markets in several cities. Those are some bigger events filled with all kinds of wonders. For example there is one big market in a town nearby every early summer and it does really attract a lot of people. This market is located in a park and it is full with medieval food vendors, knights, gleemen, music and and and. So I was rather sceptical when I heard they had this also planned for my hometown in the city center. To be precise it was to be held in the old market square next to the Vicelin Church from 1834. At least the location was not that bad as there are some historical buildings around but I knew it wouldn’t reach the authentic feeling as the Medieval Market in the other town in the middle of a park. This event had a rather bad timing as the weekend it was running we had on the first day a rainstorm and on the second day very cold wind with some little rain here and there. I think you can imagine that the market was rather empty as it was really not an inviting weather to go outside your home. As my wife was down with a flu those days she stayed home and I went together with my parents, Nathan and MIL. Yes, dear Chinese mother-in-law was coming with because she really needed to get out of the apartment as in the beginning she spent most of the time indoor doing nothing but cooking, spreading her oily handprints around the apartment and playing with Nathan. So we went out facing the cold wind and some rain in the hope to find some joy at the market. 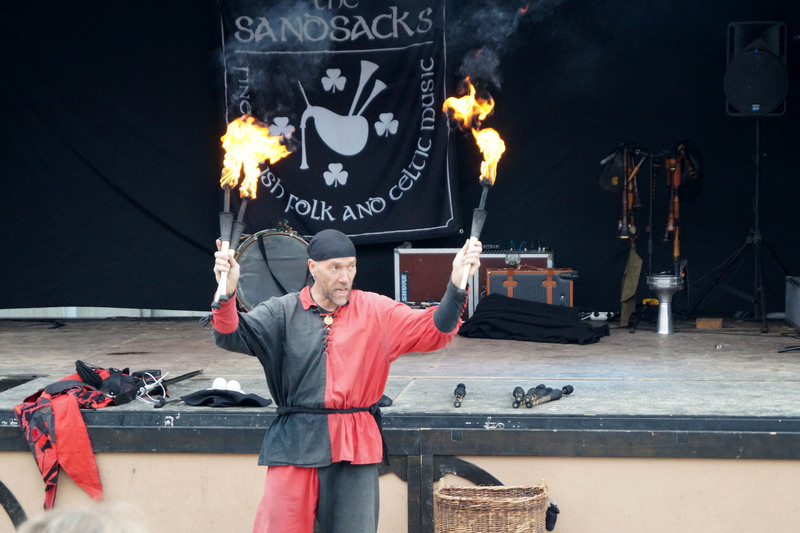 To our surprise it was not completely empty and there were few things going on such as a gleemen juggling torches, “music from the middle ages” on another stage and a lot of food and handmade products all around. Nathan surely had a lot to take in as he was facing rather dumbfounded around with his little mouth open. Though we were not really hungry we still bought some fresh bread from one of the food stalls which was still warm and it helped to fight off the cold for a while. Even though this market was still worlds away from the ones I have been visiting during the past years in Germany it was still nice to have one here in this little town. Next month there will be once again the big Medieval market in the nearby town and I will definitely visit it with Nathan, my wife and dear mother-in-law to show them how wonderful it can be. There is just so much to discover on such a big market and lets see what kind of useless stuff I might buy for myself or for Nathan (perhaps chainmail for him?). And now many many pictures for you, I just couldn’t decide which ones to upload so I chose them all! Meat! We need more meat! Have you ever visited such an Medieval Marekt or something similar?